Hello from the APT book club! We recently met at Tamar’s lovely home to discuss “The Whole Brain Child” by Dan Siegel and Tina Payne Bryson. The Whole Brain Child provides 12 strategies to “nurture” the child’s mind as they grow and mature. It’s an extremely user-friendly book that makes the neurology easy to understand and the strategies easy to implement. We have been using some in the clinic (and with our own kids!) since reading the book, many of us for the 2nd time. We have been using the Wheel of Awareness, “What would you do?” questions, engage don’t enrage and S.I.F.T. most specifically. Feel free to ask about the book or borrow one of our copies. We’re here for you! 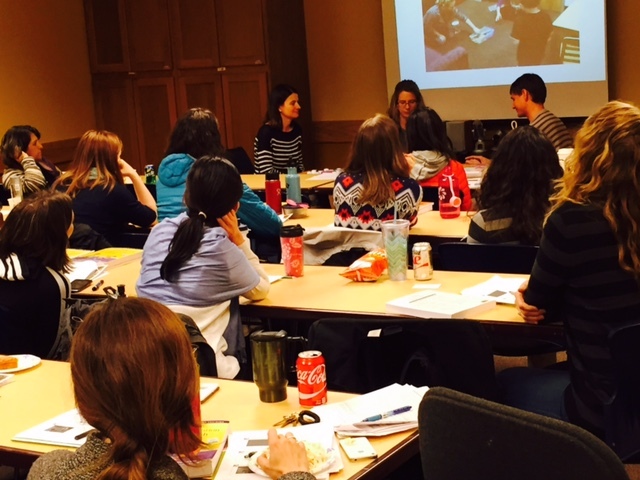 On the weekend of April 24th and 25th, APT participated in Project Impact training at the Albertina Kerr Center. Project Impact was created by Brooke Ingersoll PhD, and Anna Dvortcsak MS, CCC-SLP in order to help children with autism be able to connect with parents and caregivers in meaningful ways. The program is the result of years of development and implementation in Oregon and Michigan. The parent training program is a unique intervention technique which draws from both developmental and behavioral literature. Therapists facilitate interactions between parent and child to bring about progress in communication, but also allowing for greater connection between them. How do you know if Project Impact would be beneficial for your family? Parents should be willing to participate directly with their child, have a schedule and the support that would accommodate the ability to participate, time and energy to devote, and who consider it a priority to be involved. Your child should be 7 years of age or younger, have a communication related diagnosis such as autism and your child is working on social communication goals. Why are parents trained instead of therapists implementing the treatment? The involvement and commitment of parents ensures better generalization and maintenance of skills, increases parental optimism, decreases parent stress and is cost effective. Parents live with the child, so obviously they can implement strategies all week long, not just during therapy. What are the skills taught in Project Impact? The core skills which are facilitated during Project Impact training are social engagement (ability to maintain interactions by responding to and initiating social bids by others), language (receptive and expressive abilities), social imitation (plays a critical role in development of other more complex social communication) and play (the cornerstone of development in children). There are a variety of intervention techniques taught to parents which work on these skills. Please ask your occupational therapist if you would like more information! from “Teaching Social Communication to Children with Autism,” by Brooke Ingersoll and Anna Dvortcsak, The Guilford Press, 2010. 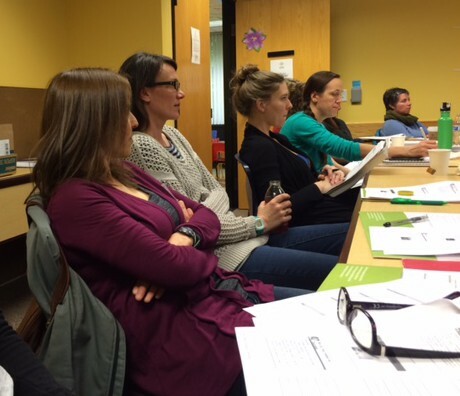 We were thrilled to welcome Tracy Stackhouse to our Portland clinic on March 6 and 7th. 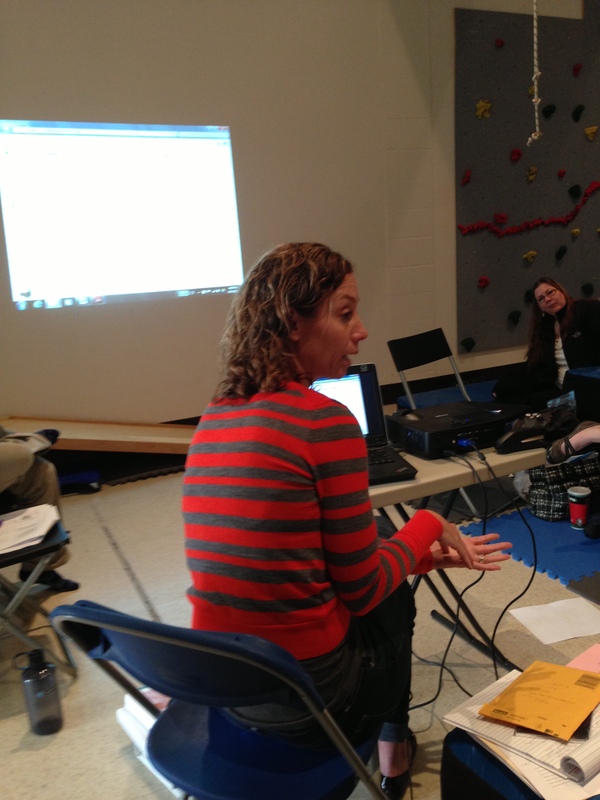 Tracy spoke about her STEP-SI model. The model helps practitioners use clinical reasoning to understand our clients better and plan treatment with a deeper understanding of the impact of sensory processing, relationships, environments, arousal level, predictability and tasks. Tracy’s work is deeply embedded in the research of Jean Ayres who pioneered sensory integration as we know it today. Tracy’s fun and information-packed lectures gave us lots to think about and discuss during that weekend and all our workdays since! Thank you Tracy for an incredibly informative and dynamic weekend! Tracy, a Colorado native, is president and co-founder of Developmental FX. She is a leading pediatric occupational therapist (OT) involved in clinical treatment, research, mentoring, and training regarding OT intervention for persons with neurodevelopmental disorders, especially Fragile X Syndrome and autism. She received her undergraduate degree in occupational therapy from Colorado State University and a a master’s degree in developmental psychology from the University of Denver. She received her NDT training with Lois Bly. She is SIPT Certified (Sensory Integration and Praxis Test). and was the clinical specialist in sensory integration at The Children’s Hospital in Denver as well as the OT for the Fragile X Research and Treatment Center. 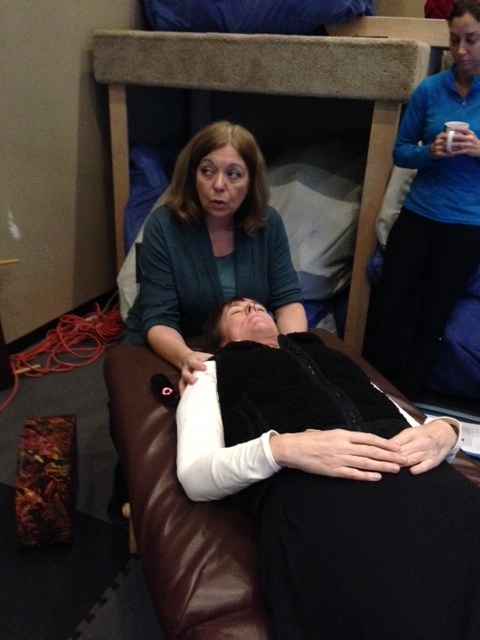 Tracy continued her clinical and research work with Dr. Randi Hagerman at the UC Davis M.I.N.D. Institute during its start-up year. Tracy has written several book chapters on sensory integration and neurodevelopmental disorders, and teaches and consults nationally and internationally on sensory integration, Fragile X and related topics. Tracy and her husband have two children. *from the website for Developmental Fx. 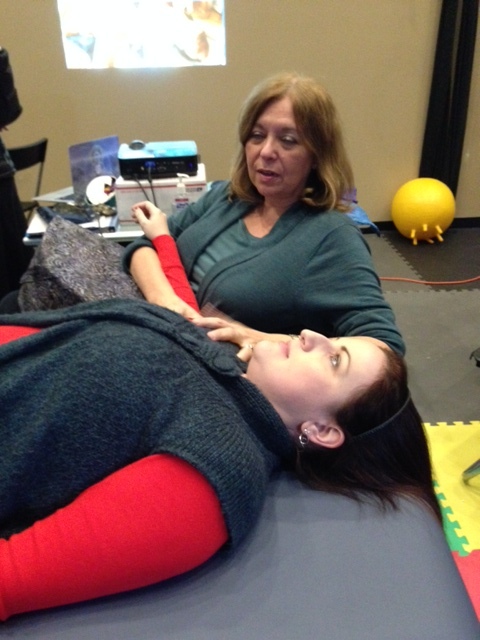 Mandy learns about and receives cranio-sacral therapy from our guest instructor, Cathy Holway of The Neurovascular Institute. In early December, some APT and other therapists joined us to welcome Cathy Holway from the Neurovascular Institute to learn about cranio-sacral therapy. Cathy is a doctor of physical therapy who received her training from the Upledger Institute, then later created her own form of work, Sacred Spaces, which has evolved into the Neurovascular Institute. From her website: the curriculum continues to synthesize outstanding, science-based medical education with the art and spirit of healing. We spent the weekend practicing on each other, getting immersed in neuroanatomy and neurophysiology and brainstorming how to use the treatment with our kiddos. Cathy tells us that touch rewires the brain. When touch is used to access the brain, as in cranio-sacral therapy (CST), the goal is to help a client (child or adult) to move in the world with less effort and to engage with the world in a more positive way. In a typical session of about 30 minutes to an hour, the therapist moves along the client’s body “holding” in certain ways and areas to provide a release to the neurophysiology of the tissues. As the practitioner, we learned that our presence, touch and breath has a profound influence on the effectiveness of CST. For most of our kids, this would mean activating the parasympathetic nervous system to help calm and relax the child. If you’d like to learn more about CST to see if it might be right for your child, speak to your OT or visit Dr. Cathy’s website where you will find a wealth of information. Headphones and Music: What’s Therapeutic Listening? 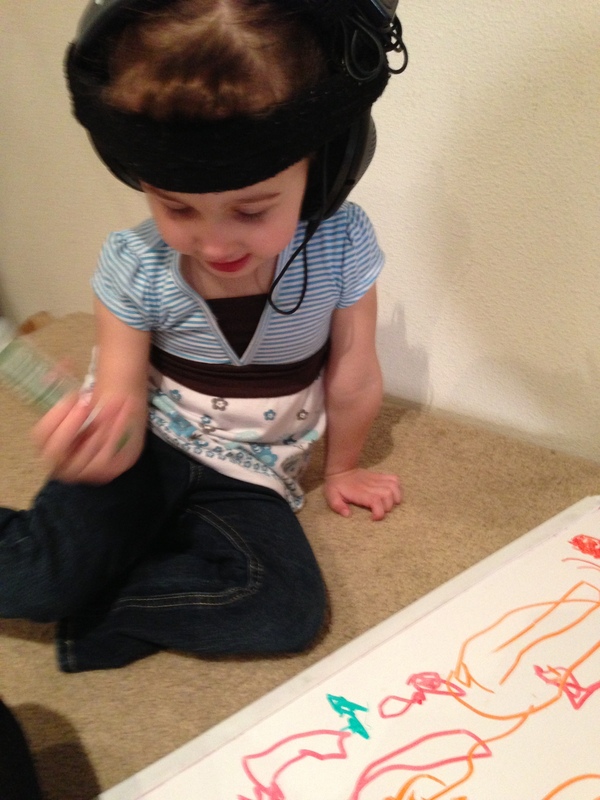 3 year old Alexa wears headphones during writing activity. You may have seen kids wearing headphones in and around the clinic. Your therapist may or may not have talked to you about TLP, or the Therapeutic Listening Program. As therapists, we frequently refer to the program as “TLP” or “listening.” Any of us would love to answer any questions you might have about the program. In a nutshell, therapeutic listening is a tool for treating a variety of issues related to problems with sensory processing including focus/attention, mood, energy, tolerance for noise, sleep, handwriting and anxiety. One of the best ways to learn about therapeutic listening and its benefits is to visit the website vitallinks.net and view the video on the front page. With a smattering of case examples and the scientific basis for the program, you are sure to understand TLP more completely. Your APT therapists all attended the Mentorship Listening day. 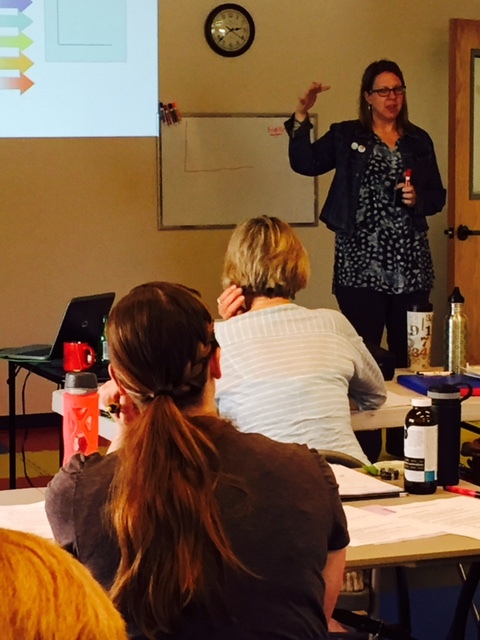 Last month, all APT occupational therapists and some invited colleagues attended a mentorship day with Sharron Donnelly to refresh our skills in providing listening to kids, choosing music, sharing case stories and troubleshooting. It was a fantastic gathering with lots of professional problem solving and interaction. We all left with renewed confidence both in the program and in our skills implementing it. Please visit the Vital Links website, talk with your therapist and even other families who have used the program. We have informational articles, research and home programs we can discuss with you. All of us at our annual holiday party. Now that’s a pretty snowflake! Welcome to the Advanced Pediatric Therapies blog! Welcome to the new Advanced Pediatric Therapies blog! Please refer to our website for information on our clinic including our staff, location and how to find out if APT is right for your child. Our goal is to provide a forum that not only tells who we are and what we do, but also allows for fun, community and active engagement. Please let us know if there is a topic you would like covered in the blog. We want you to be part of it’s development. We thought we’d tell you about the phenomenal weekend we spent with Patty Oetter. Patty comes to us from a private consulting practice in California and is well known to OT’s as the founder of the MORE (acronym for motor components, oral organization, respiratory demands and elements of toys that can be used to promote all of them) program. She has an easy and natural way with kids that makes them feel instantly comfortable. It may seem unusual, but Patty tells us that the mouth is the starting point of development throughout the rest of the body. 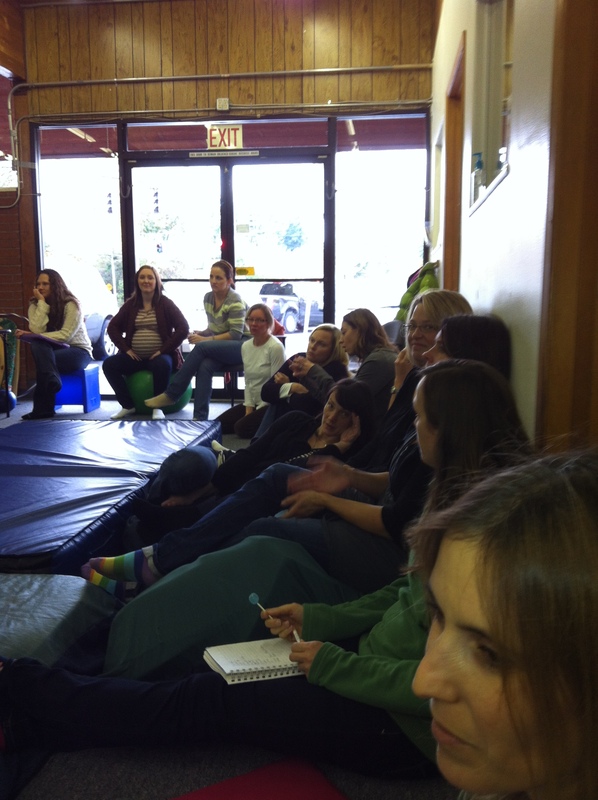 We spent the weekend with not only all of us at APT but other local OT’s who gathered to hear Patty’s pearls of wisdom. We all came out rejuvenated and ready to share our knowledge with all of you! We want to thank the families who brought their children in to us for Patty to treat and also all our OT friends who came and helped make the weekend such a fun and educational one. 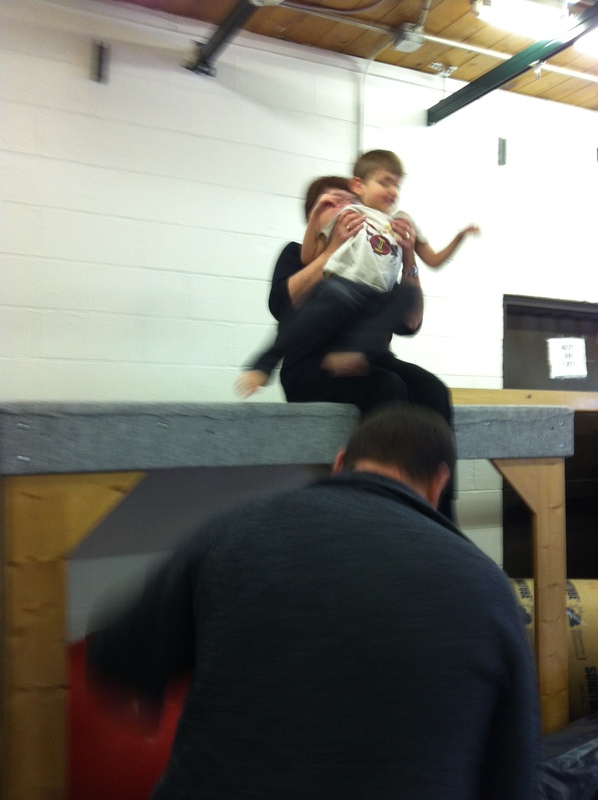 Patty helps EJ jump from the platform for the very first time! Patty is the author of “M.O.R.E. Integrating the Mouth with Sensory and Postural Functions” which has a companion DVD. 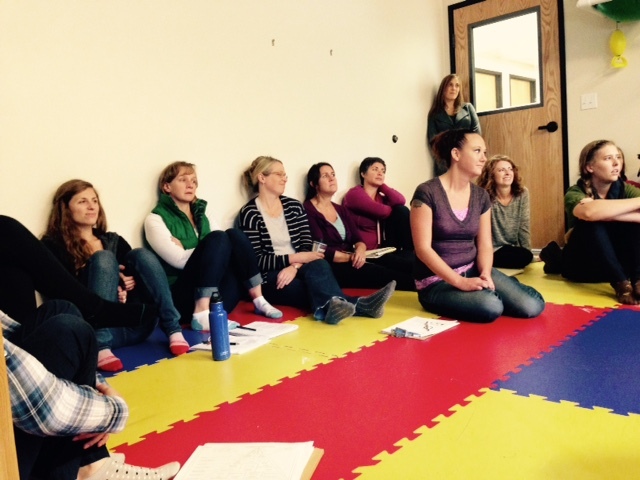 At the course, we learned techniques for use of oral motor intervention strategies, respiratory strategies and postural development. We also were reminded about the healing power of touch and the importance of the energy we feel from each other in the therapeutic process. Ask your therapist for more information. The most important thing we learned from Patty is that you have to work from where you are and not try to jump ahead too quickly. That way all kids are able to feel successful.